Marilyn SanClemente March 18, 2019 March 18, 2019 Easter, Occasions catalog, Stampin' Up! 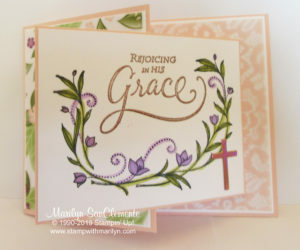 Today I am sharing an Elegant Easter card that I made with the His Grace Stamp set from Stampin’ Up!. I love the elegant grace of the His Grace stamp set. For this card I used the beautiful Floral Romance Designer series paper from Stampin’ up! This paper has two printed vellum patterns that are stunning and 4 other sheets of printed designs. I have used the two printed vellum patterns today. One is the pattern with the pretty purple flowers and the other is a scroll pattern in Petal Pink. Vellum is a clear translucent paper so I have found that to show off the design best is to put a piece of whisper white cardstock behind the vellum. the Card base is a piece of Petal Pink cardstock cut to 4 1/4″ x 11″ and scored at 5 1/2″. I then cut off a 2 1/2″ piece from the top layer. The top layer is a 2 7/8″ x 4 1/8″ piece of whisper white cardstock with the same size piece of Floral Romance designer vellum layered over it. Next I layered a 4 1/8″ x 5 3/8″ piece of Whisper White cardstock with the same size piece of Floral Romance Petal Pink Vellum layered over it. Whisper White cardstock. On the top piece I stamped the Floral Swirl from the His Grace stamp set with Tuxedo Black Momento ink on the top. I then stamped the sentiment “Rejoicing in His Grace” with versamark ink and embossed the sentiment with Copper Embossing powder. Next I colored the Floral Swirl image with Old Olive and Highland Heather Stampin’ blends. On the second piece I stamped the single flower twice and also colored those with the Blends markers. I stamped the sentiment “May his precious GIFT be yours” with versamark ink and embossed this with Copper Embossing powder. This piece is attached to the inside of the card. Now attach this “smaller card” to the inside of the larger card with the fold on the smaller card to the right so the pieces overlap. Lastly I used the small Cross framelit from the Crosses of Hope framelit dies to cut the cross on the front piece of the card and the inside of the card from a piece of copper foil. This is a card that I designed for my monthly Stamp Club. Each month stamp club members get together and we make 4 unique projects. 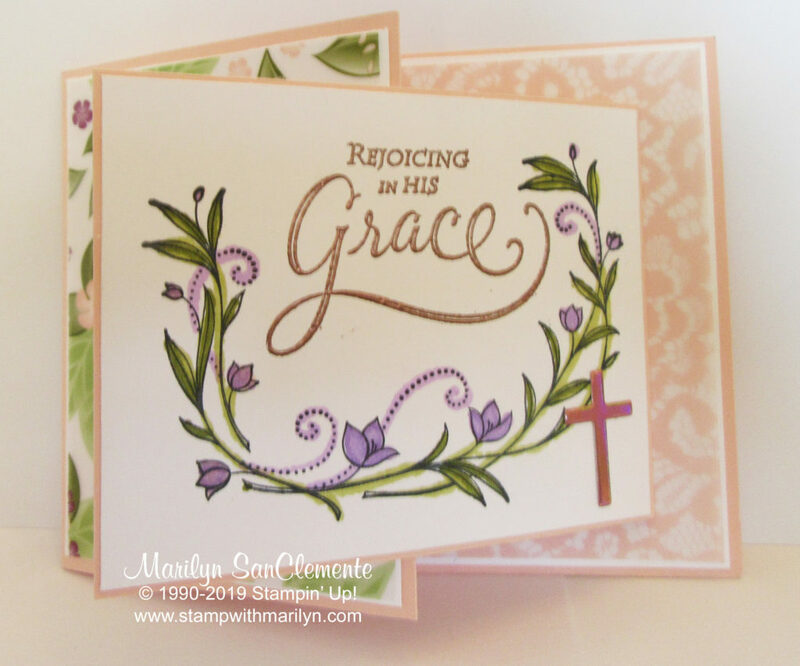 Elegant Easter Card, handmade Easter Card, HIs Grace Stamp set. Bookmark. New Stampin’ Up! Storage available! !